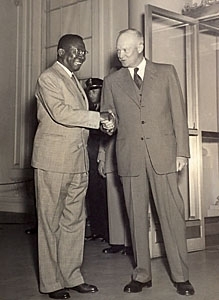 U. S. President Dwight D. Eisenhower welcomes Liberian President William V.S. Tubman, White House, 1954. William Vacanarat Shadrach Tubman, an Americo-Liberian, served 27 years as President of Liberia, longer than any president before or after him. Tubman, who is regarded by some in his country as the “father of modern Liberia,” was born on November 29, 1895 in Harper, Liberia. His father, Rev. Alexander Tubman, was Speaker of the Liberian House of Representatives. Tubman studied law under private tutors, passed the Liberian bar exam, and became a lawyer in 1917. After serving as a county recorder, tax collector, and teacher he entered politics and in 1923 at the age of 28 was elected to the Liberian Senate representing Maryland County. In the Senate Tubman became noted for advocating the extension of constitutional rights to indigenous Liberians. In 1937 he was appointed to the Liberian Supreme Court. Tubman ran for President of Liberia and easily won the contest on May 4, 1944. Once in office Tubman promoted the National Unification Policy which called for the reduction of distinctions between the politically and economically dominant Americo-Liberian minority and the indigenous people who comprised the vast majority of the nation’s inhabitants. He also extended voting rights to all Liberian women. Claiming that Liberia never received the “benefits of colonization” Tubman encouraged foreign aid and foreign investment in his nation. He also encouraged foreign businesses to locate in Liberia. This policy had considerable success. Between 1944 and 1970 the value of foreign investments increased by over 200%. By the latter date Liberia had received more than one billion dollars in U.S. investments. Liberia also received significant investment from Sweden and the largest investment from Germany at that time. Tubman expanded the port of Monrovia and initiated the “flag of convenience” program where ships of various nations registered in Liberia because of its lower fees. The revenue from this program allowed Liberia to end its national budget deficits for the first time in its history. As Liberia became more prosperous, Tubman began a modernization program, paving the streets of Monrovia, the capital, building roads and railroads into the interior, establishing hospitals, and creating the first national sanitation system. He also expanded the University of Liberia, established teacher training institutes to train instructors for the growing number of secondary and primary schools, and built agricultural extension stations to assist farmers in raising crops and livestock. Tubman’s policies, including his unification efforts, sparked opposition and in 1955 he was the target of an assassination attempt by political rivals. In response Tubman imposed harsh measures and began a period of near dictatorial rule. William S.V. Tubman remained President of Liberia until his death in a London, UK clinic on July 23, 1971. Charles Morrow Wilson, Liberia: Black Africa in Microcosm (New York: Harper and Row, 1971); F. P. M. van der Kraaij, The Open Door Policy of Liberia: An economic history of modern Liberia (Bremen, Germany: Im Selbstverlag des Museums, 1983); http://www.liberiapastandpresent.org/William%20Tubman.htm.